We didn’t do much science over the summer and we haven’t started our science curriculum, so I was excited to review Science4Us! 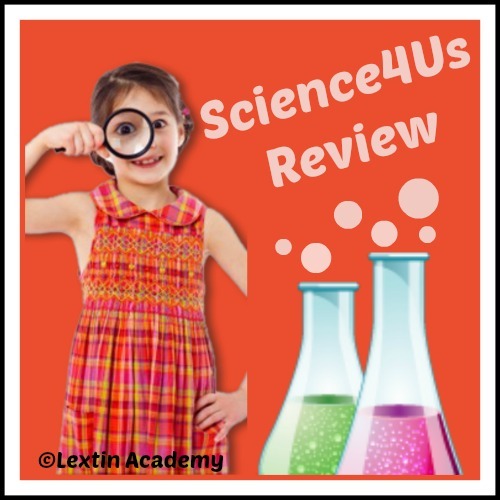 Science4Us is an interactive online science curricula that is geared for grades K-2. This is a complete program that covers a wide variety of science topics in order to provide students with an overview of various aspects of science, giving them a strong foundation for later years. Physical – This section covers topics related to matter, mixtures, energy, forces, magnets, and motion. Inquiry – This section teaches a student how to think like a scientist and learn to make observations. The student learns about qualitative and quantitative observations as well as measure, weigh, and balance scales. Life – In this section the student learns about living vs. nonliving things, plants, animals, habitats, and conversation. The student learns to classify plants and animals as well as learning about what they need to live. Earth/Space – This section describes the history of earth, materials found on earth, different geological features, weather, space, and the solar system. Each section begins with an overview of the topic with videos and interactive demonstrations. The later sections have games and activities to test the student’s understanding of the topics and provide reinforcement of concepts and vocabulary words. The program also includes lesson plans with an overview of each topic to help the teacher prepare. There are also printable worksheets and ideas for hands-on activities and experiments. The program can be purchased on an individual basis for $7.95 per child for each month. All 3 of my older kids had a chance to review this program. Curly was able to complete all of her lessons by herself and then give me a brief recap of her lessons. Tiger used the program mostly on his own but did need help with a few sections. I always stayed nearby to make sure he was completing each section and didn’t have any questions. Quite a few parts of the program were over Bee’s head and she needed Tiger or Curly nearby to help her understand many of the topics. She did have a great time watching the videos and trying to play the games though. A few sections of the program were a little difficult for kids who can’t read. Tiger struggled with a section in which he was to write a poem. He had trouble understanding the instructions and choosing words to complete his poem. He enlisted the help of Curly who was easily able to do it. So, while most of the program does have audio, there were a few parts that were tricky for a non-reader. There are some discussion questions posed in each section, so a parent would need to be nearby to make sure the student understood concepts and didn’t just skip over these sections. In these sections, a question is given and the student is to respond orally, explaining and describing what he has learned. While the program does try to incorporate other aspects of learning such as language arts topics or some math – I felt like some of the language arts activities were a bit of a stretch and my kids did not enjoy them as much. The portion where they would write a poem was frustrating to them and they were more interested in progressing through the science topics. However, one of their favorite activities was the Syllables with Silly Bulls in which a student puts the syllables together to form vocabulary words. This was great practice for segmenting words. I wish it were easier to tell if a student had completed a topical section. While the program does show when the small subsections of each topic are completed, there is nothing to indicate when all the activities for a particular topic (such as weather) had been completed. I wish it were easier for the student to glance at the topical list and quickly see which sections had been completed. This curriculum does approach topics from an old earth/evolutionary standpoint which is not what we believe at our house. So, there were a couple things about “millions of years” or evolutionary-type references that I had to stop and explain to my kids. So, depending on your belief system, this program might not quite match. It was very interactive. There were games, videos, quizzes and other fun tools to make sure the student understood each topic. My kids really enjoyed the cute games that reinforced the lessons. And the videos were very helpful for them to picture what they were learning about. If a child clicks on a wrong response, the program takes them back to the part of the lesson where that topic was covered. I love that it doesn’t just give them the answer and move forward – it has them discover the answer and then retry. There are multiple sections within each topic, so the child has many chances to review the concepts that were introduced in that lesson. I felt this really helped my kids retain the information. My kids had so much fun doing their science on the computer. They learned several many vocabulary words and covered some new topics. I found it to be a good fit for the target age-range as well. Tiger found the program to be challenging and Curly found the topics to be interesting and the program fit her ability level well. It provided a great overview to a wide variety of science topics. This program would be perfect as a fun science supplement or even a full program when you add in some resources, complete the worksheets, and try a few of the recommended experiments. Disclaimer: I received a free 1-month trial of this product in exchange for an honest review. I was not required to write a positive review nor was I compensated in any other way. All opinions I have expressed are my own. I am disclosing this in accordance with the FTC regulations. I really appreciated your review. I also had the opportunity to check out Science4Us recently. Science is my daughter's favorite subject and even though she is a bit over the target age, the program would make a great review for older students. I love that the lessons are pre-planned. Sometimes it is hard to get science planned out ahead of my daughter, so the preplanned lessons are a great benefit. If you find that your students don't like the language arts and math portions I think it would probably be ok for them to use the program just for the science part of it. Thanks again for such a thorough review!